As you know we all love a bargain and this is exactly what you get with this theme package. 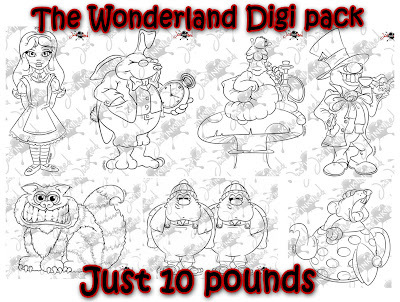 The wonderland Digi Pack gives you seven superbly fashioned digi stamps for the brilliant price of £10.00 no waiting around for your stamps to arrive as with our digital stamps at Just Inklined you get the download link as soon as you make your payment. Just click on the image to purchase the Wonderland Digi Pack, Of course you can purchase all of the stamps individually at £2.00 each but the pack of all of them is giving you a saving of £4.00.